Happy Monday everyone! Okay, so I have a question for you. Have you ever tried baking with a 3 year old? And then also made a video of this, let’s say, adventure in the kitchen? 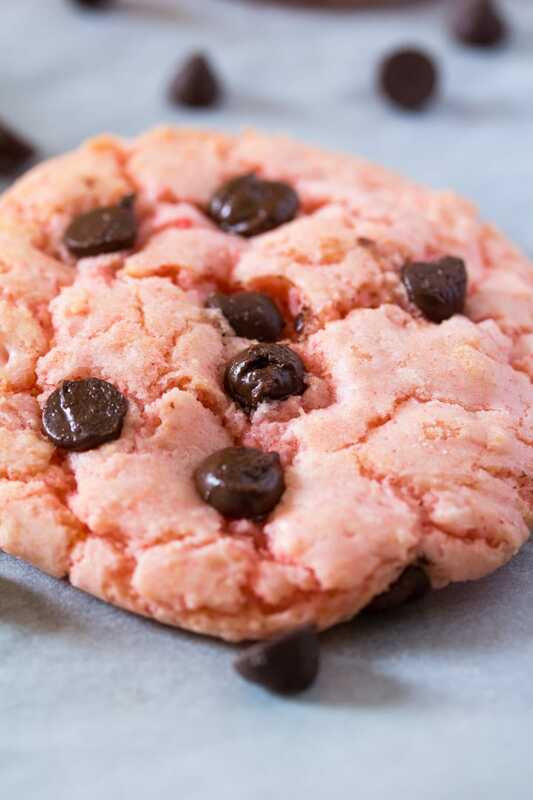 Because I have – specifically these Strawberry Cake Mix Cookies, and if you’re a neat freak mom like me, you know how exasperatingly slow and messy the baking process can be with a toddler. Add a tripod, and expensive camera, and artificial lights to the mix. And you’ve got a disaster on the verge. Yet, when you look at your 3 year old’s big smile, it all becomes worth it. Except for the time she bumped into the tripod and almost crashed the camera, but let’s not talk about that. Lol. 1.) Baking with a toddler can be as stressful as it is, with all the possible messes and things breaking, etc etc. 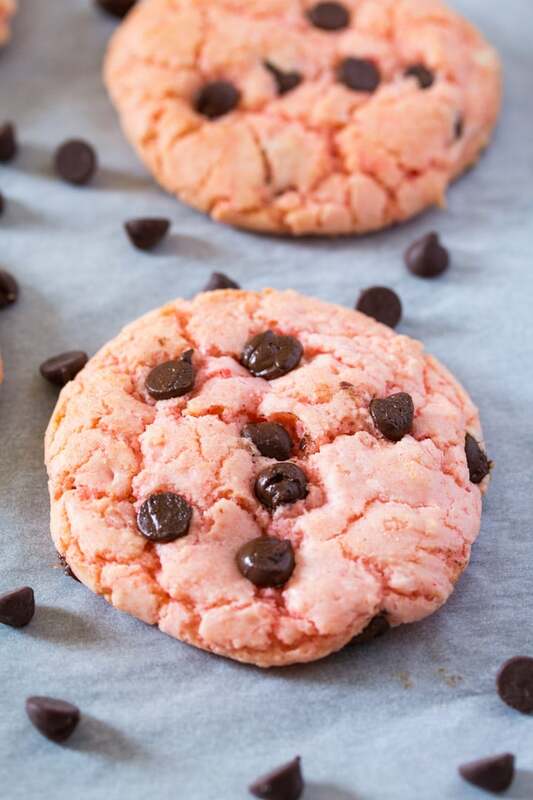 So this recipe for Strawberry Cake Mix Cookies is perfect because it’s probably these easiest baking recipe you can find. 2.) Four ingredients: Strawberry Cake Mix, Vegetable Oil, Eggs and Chocolate Chips. That’s all. 3.) 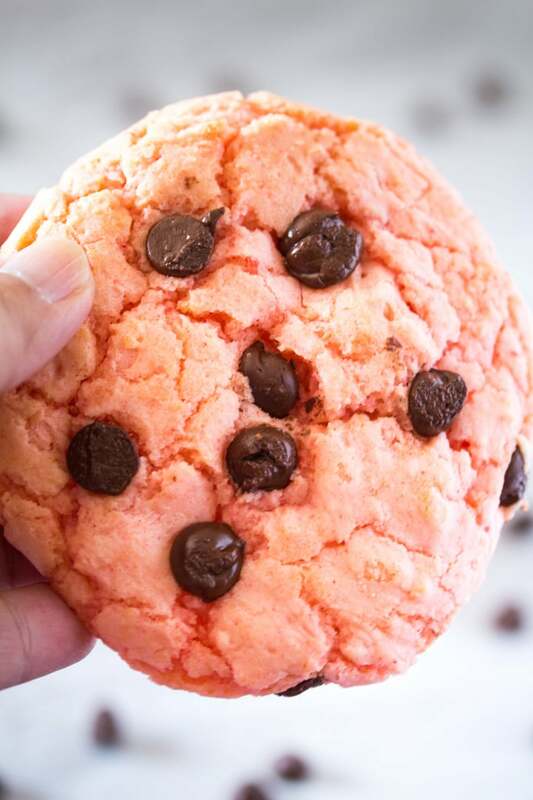 These Strawberry Cake Mix Cookies are no mixer, so they’re as easy as it gets! 4.) No chilling time required. We all know little kids have no patience, so this is a good thing. They won’t keep saying: moooom, when will the cookies be ready, or mommmm, when can I eat the cookies? 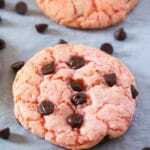 So while I can’t say your experience will be perfectly neat and accident free when making these Strawberry Cake Mix Cookies, I can guarantee you one thing. And that is, you’ll be making lots of memories with your toddler in the kitchen. And those are the fondest of all. P.S. don’t forget to dunk the cookies in the milk! 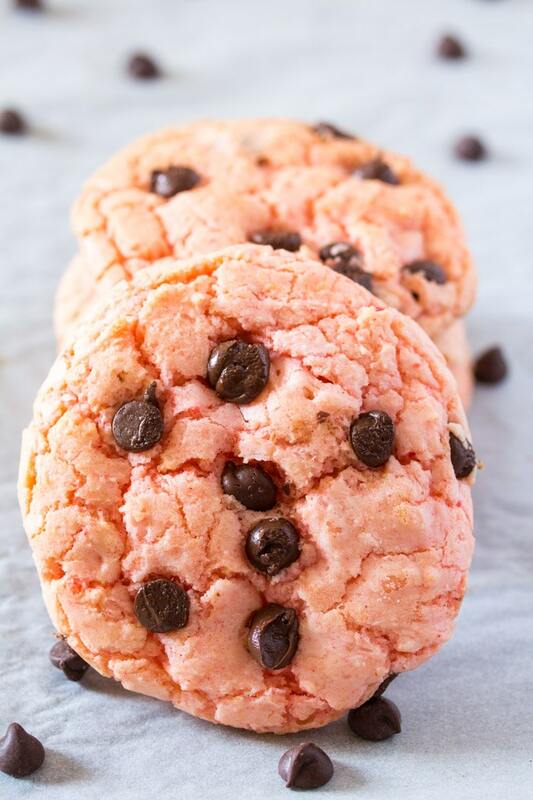 Strawberry Cake Mix Cookies (ft. a 3 year old in the kitchen) are made with only 4 ingredients, and are soft, chewy and delicious. Perfect treat to make with your kids! Preheat oven to 350 F and prepare a baking sheet by lining it with parchment paper. In a mixing bowl, combine the cake mix, oil and eggs until fully incorporated. Using a tablespoon scoop, scoop the dough onto the baking sheet tray, at least 2 inches apart. Bake the cookies for 10-12 minutes, or until the cookies are just about set in the middle. Cool for a few minutes on the baking sheet and then transfer to a cooling rack. So sweet, I love getting my kids in the kitchen!